Stuff Points: Earn 14 points when you buy this stuff. A meat eater vs. a herbivore? Triceratops doesn't stand a chance. Or does he? Just as T-Rex gets distracted by his ridiculously short arms, Triceratops powers in with his sharp horns and protective crest. Like a tank entering the battlefield, the three horned dinosaur easily plows through the pompous predator. 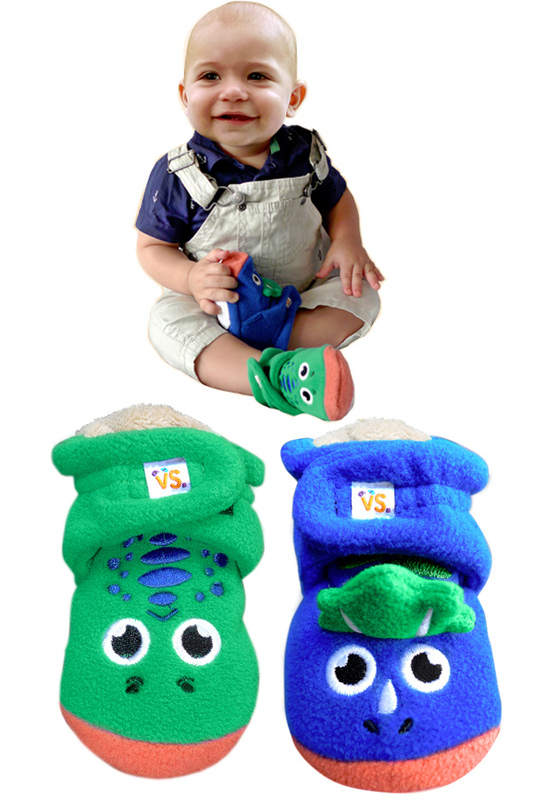 As much fun as they are functional, these fleece booties will look perfect on your future paleontologist. Incredible details give them character, and superior construction makes them a quality foot cover. The Sherpa lining is soft and breathable, and the fleece outer layer is vibrant and easy to care for. A handy strap at the top adjusts for size and keeps them on their feet. They are totally machine washable when dirty, and they are designed to fit boys or girls from 6-12 months of age. One foot is a Tyrannosaurus Rex, and the other foot is a Triceratops. 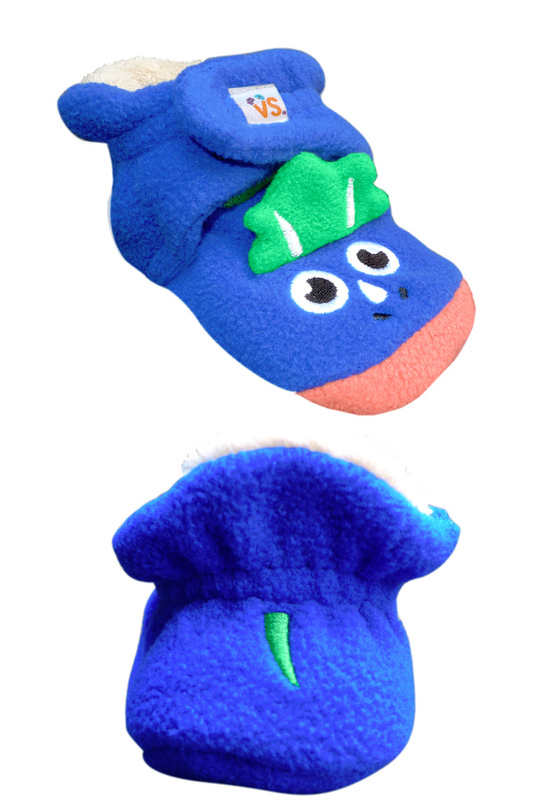 This fun pair doubles as wearable puppets, and they will keep tiny feet happy and warm at the same time. Perfect for playtime year round. Lightweight. Super comfy, but not too bulky. Your baby will love to wear them. Breathable. Warm when it's cold, but not stifling when it's warmer. Their little feet will be comfortable in any climate. Fun. They double as puppets due to fun faces and opposing characters. Comfortable. A plush interior, and a silky soft exterior allows for maximum comfort. The simple closure will not cause discomfort. Love the concept, but not digging this product? Check out the Vs. Mittens for predator vs. prey pairs that go on children's hands. Order Yours Today! Grrrrrr. Look out for the mighty T-Rex. 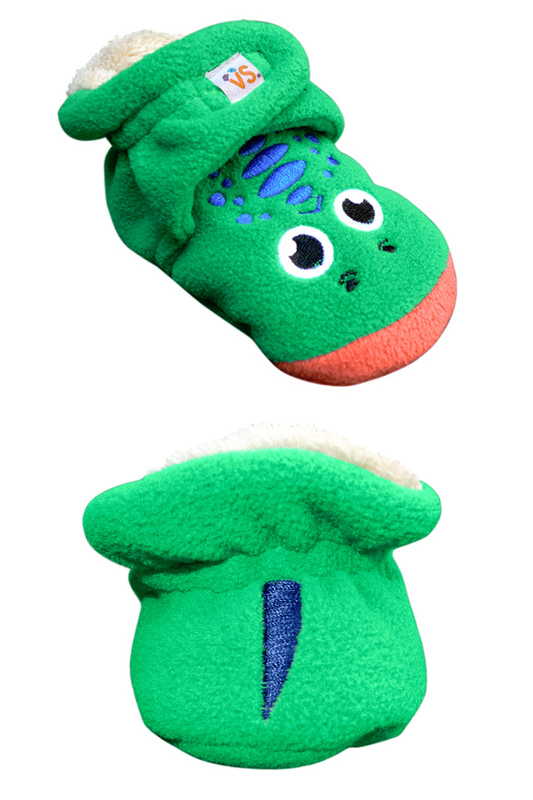 This amusing pair will make the perfect addition to baby's feet. Soft, lightweight and tons of fun. Order Yours Today! Size 6-12 Months. Predator And Prey Combo Pair For Guaranteed Fun.